(P1 If a patent secured by Boeing this week is any indication, the company is eyeing a major change in the way travelers fly. The Seattle Times reports the patent details a passenger plane that takes off and lands vertically like a helicopter via tilting rotors. The rotors, horizontal for takeoff and landing, rotate to become propellers during flight. Boeing was one of two developers behind the US military’s similar V-22 Osprey, which went into service in 2007. However, the Osprey can only carry up to 24 soldiers. And a prototype for a commercial plane that takes off and lands vertically from Bell, the other developer of the Osprey, can only carry nine passengers, according to Business Insider. 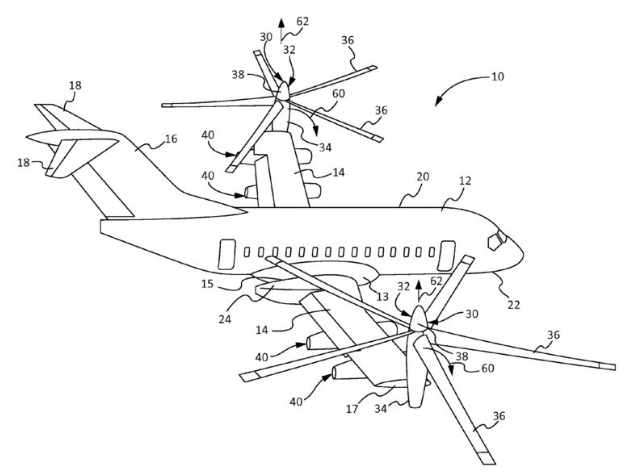 Boeing’s patent calls for a plane that carries 100 passengers. Do you think Boeing will eventually build this plane for commercial use? Why or why not? Why do you think Boeing files tons of patents? Would you like to fly in an aircraft similar to the one in Boeing’s patent? Why or why not? What’s the name of an almost identical aircraft to Boeing’s patent? Who is the other company who helped develop the US military’s Osprey? How many engines will the Boeing passenger plane have?